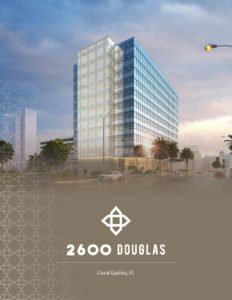 2600 Douglas has been thoughtfully re-envisioned with today’s workforce in mind. The project has just completed Phase I of extensive renovations resulting in a functional and efficient building with attractive amenities. 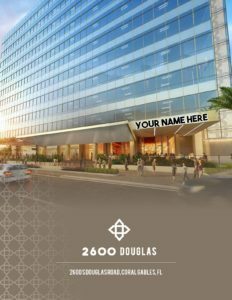 Completed renovations include updated lobby, common areas, elevator landings, restrooms, elevator modernization, impressive new main entrance with a welcoming terrace and porte-cochere and valet drop off area. As we embark on the next Phase of the renovations, the building’s north and side end caps will be upgraded with a truly unique metal cladding design and a Tenant Hub and Conferencing Center is under construction, adding to our already spectacular amenities. 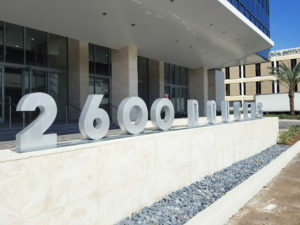 2600 Douglas is walking distance to Miracle Mile and the Central Business District of Coral Gables making it the ideal location for quality tenants. We currently have ground floor retail space and office units available for lease ranging between 1,400 SF and approximately 13,000 SF.